These days we take the right to roam for granted. There’s so much access land that it sometimes feels as if we can walk almost anywhere. But that wasn’t always the case. For many years the big landowners – and they really did own most of the countryside – had blocked access to walkers, even where old footpaths and rights of way existed. That all began to change on April 24, 1932, with the event known as the Kinder Scout Mass Trespass, possibly the single most important event in rambling history in the UK. It paved the way for the freedom we have today, and also, indirectly, to the creation of the National Park system. All of that is due to the 400 walkers who dared to flout the system. It had all started a little earlier in the year, when a group of hikers from Manchester had been stopped at Bleaklow, in Derbyshire, by gamekeepers who insisted they were trespassing. The walkers felt their ancient rights had been taken away. Frustrated by this, and also the fact that a Right to Roam bill had stalled in Parliament, they determined on a mass trespass. Kinder Scout, the highest point in the Peak District, was chosen, on land owned by the Duke of Devonshire. It was well publicised, and some 400 walkers, members of the British Walkers Sports Federation, assembled in Hayfield, near Glossop, to head up to Kinder Scout. Police and county officials were on hand but stood back as the walkers set off early in the afternoon. They hadn’t gone too far before they saw gamekeepers on the slope known as William Clough, and the first scuffles happened, where one of the keepers was injured, and one of the walkers arrested. But the group pushed on to the summit, up to Ashop Head, where they joined up with another group from Sheffield – only around 30 of them – who’d come over from Edale, and watched the fighting from the top of Jacob’s Ladder. The leaders of the groups congratulated all those who’d made it to the top, but also issued a sobering warning that some of them might well be fined for their actions. With that the groups started to make their way back. Once the Manchester group had returned in Hayfield, they were stopped by the police (accompanied by gamekeepers), and five of them were arrested then taken to the tiny jail in the village, making a total of six in custody. Those arrested were in court in New Mills the following day, all charged with breach of the peace and unlawful assembly for their actions. They pleaded not guilty, which meant a trial, to be held at Derby Assizes, with all of them remanded until the trial date in July. This was serious, but that, after all, had been the intention. The men knew there’d be a confrontation, and they wanted the publicity for their cause, even though it could have serious consequences for them. Those consequences did prove serious indeed. When the case finally reached court, five of the men were found guilty and given jail sentences that ranged between two and six months, the intention being to make martyrs of them and discourage others. It didn’t quite work that way. Instead, it made heroes of them, and the idea of the Right to Roam became much larger than ever before. Not long after the sentences had been passed, a group of ramblers came together in Castleton, also in the Peak District. 10,000 strong, it was the biggest group of walkers ever assembled. Hikers weren’t about to be cowed. 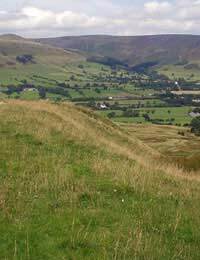 Eventually, in 1951, the land in the Peaks became Britain’s first National Park, although it wasn’t until 2000 that the Countryside and Rights of Way Act passed in Parliament, making open access completely legal. Two years later, 70 years to the day of the mass trespass, the Duke of Devonshire apologised for the actions taken by his grandfather.